Whether we accept it or not but it is quite apparent that today technology has almost replaced the real, in-person interactions. With so many social networking sites around, people remain connected with each other all the time and yet there exists a fundamental disconnect between them! We now live in a digital world where people find themselves hard pressed for time even for face-to-face conversations with their immediate family and so try to recompense that with digital communications. However can abbreviated texts, snippets or emoticons really help in establishing emotional connection with our loved ones? Face-to-face, real conversations have been replaced by emails, text messages, tweets and chats. We have literally stopped talking to one another in the real sense. Our over dependence on technology is robbing us of the warmth and the intimacy that we associate with face-to-face interactions which make them special. As a result, most families today have a diminished sense of connection with each other and it's really sad. With the emerging mobile technologies and the social media, the world has surely come closer but can the social connections that people are making technologically in the virtual world, substitute the real interactions with our dear ones who actually exist in our real world? People remain so engrossed inside their 5.5" screens that they perhaps feel ill at ease outside of them! Wherever we go, we find people busy tapping on their phones, unmindful of their physical surroundings. It's quite a common sight now. They would either be checking emails or playing games or else would be posting on some social media. At times though, while doing this, they lose track of the physical world around them. I am not against the use of technology or social media. Having a cell phone with you, undoubtedly, can be of a huge help, especially in case of emergencies. The various social networking sites too have surely revolutionised communications. They do help us in keeping in touch with people we perhaps wouldn't have been able to meet on a regular basis. However our over indulgence in them are in a way weakening our bonds with the real world and our loved ones. We have become so addicted to these gadgets and social media that we feel lost without them. This urge to keep checking on whether we have a new notification of a message or if one of our social friends has updated about something new, is actually taking us farther away from our real relationships. Day by day we are becoming socially isolated, we are relying more on our online communications rather than real connections and interactions. We are ending up having so many acquaintances and yet so few close friends. What's actually missing is the deeper relationship between us and the real world - our family, our friends and neighbours. In such a scenario, gardening could be one activity that can not only bring people together and help them rediscover the joy of real togetherness but also can help us create memories to cherish later on. The kids too can gain rich learning opportunities. 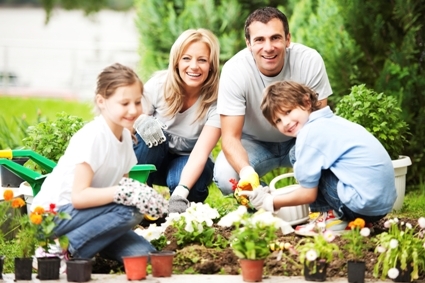 Gardening can not only prove to be a good outdoor activity for kids but can also inculcate in them the love for nature. It is a wonderful way to relax, bond and connect with family and neighbours. Moreover, it's so much better to become nature enthusiasts living in the real world than becoming an addict of the digital world! Kissan, the first ever fruit and vegetable brand in India, has always supported and encouraged people to grow fresh vegetables and fruits themselves. Kissanpur is one such concept that they have devised in that regard wherein one can register oneself and their family or friends or even neighbours. Upon registering, we can order seeds online from their website and they shall send us the seeds for planting. We can also learn many tips and tricks about growing tomatoes, they have a "tomato growing guide" that we can download from their website as well. We can also earn points from the activities wherein the top 100 growers can get their picture printed on a Kissan bottle! Isn't that interesting? Well, for more details, you may visit their website.